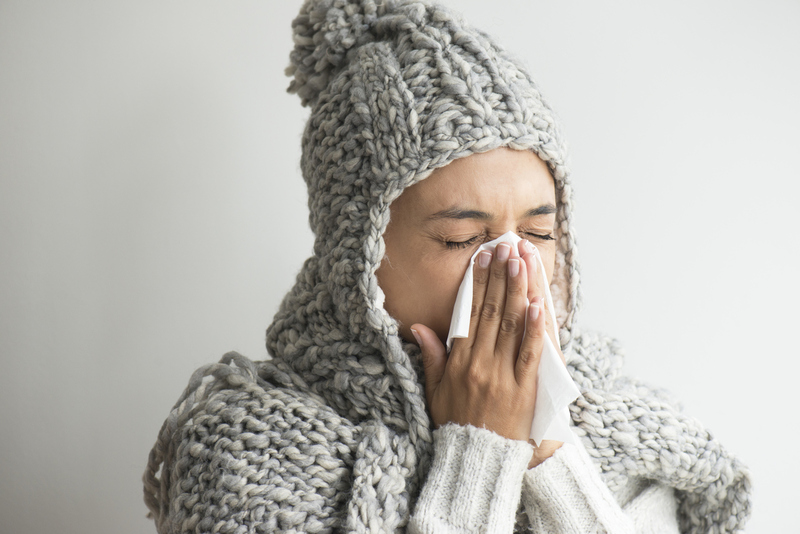 Home › Sinusitis › Are Sinus Infections Contagious? If you’re currently experiencing a sinus infection, there’s probably one question that springs to mind before any other; are sinus infections contagious? Often, we worry about passing the infection on to others and potentially putting them through the pain and discomfort we’re currently enduring. As strange as it sounds, the best answer we can provide is ‘it depends’. Today, we’re going to explain exactly why this is the case. Otherwise known as sinusitis, a sinus infection is one that causes inflammation within the lining of the sinuses. The reason why your infection will sometimes be contagious and other times completely safe comes from the term ‘sinus infection’ itself. Rather than describing a specific cause, the term describes a common issue that can have numerous causes. Since the term ‘sinus infection’ simply describes the infection, the only way to know whether it’s contagious is to get to the root cause of the issue. If your sinus infection is caused by bacteria, this often comes after a viral upper respiratory infection, the problem can be quite damaging in the short-term. With blocked sinuses full of mucus, these problems normally last for more than two weeks. However, it will not be contagious at any point which means you don’t need to worry about passing it on to family members. In terms of the bacteria itself, the most common examples include haemophilus influenza and streptococcus pneumonia. Viral sinus infections, often correlated with upper respiratory infections and colds, can be contagious. When asking the question, “Are sinus infections contagious?” it’s important to always consider the cause of the infection. The majority of sinus infections are caused by a virus. These types of infections are contagious and can be spread in a number of different ways. At this point, we should point out that it’s the virus you spread to others as opposed to the infection. After coming in direct contact with you as you experience a viral sinus infection, people are at an increased risk of getting sick but they won’t necessarily get the infection. Most of the time, they cause colds in others as opposes to the infection. All things considered, hand contact is the most common reason for spreading viruses and this is because we use our hands to touch our face, prepare food, bite our nails, and they act as the transmitters between viruses and our body. Unless we happen to wash our hands with hand sanitizer after touching hands with everyone, it can be very tough to avoid getting sick after contact. In addition to this, the air droplets produced from coughing and blowing the nose also cause issues. If you touch an item contaminated by the virus and then touch your face, eyes, or nose, the virus will find it easy to enter your own body. For children, their immune system is a little weaker which is why these types of problems spread around a school very quickly. As we know, sinus infections can also be caused by polyps, allergies, a deviated septum, and more so we highly advise receiving medical attention if you don’t know what’s causing your infection. Since they have the equipment and tests to get to the bottom of the problem, this can prevent unnecessary spreading and the right treatment moving forward. If you have a sinus infection or know of someone who has, make sure you/they know the cause before proceeding. If viral, there are some steps you can take to eliminate the risk of spreading infections. Firstly, hand hygiene is important along with vaccination, staying inside when ill, and face masks. Throughout the day, you should be washing your hands with hot soapy water and this will keep the risk of spreading to a minimum. If your child has a viral sinus infection, we recommend keeping them from school as it is almost guaranteed to spread to at least one other child. As an adult, you might also consider staying home from work or else feeling the wrath of the boss as colleagues are forced to call in sick. If you have a sinus infection, the priority should be finding the cause of the problem. If not viral, you aren’t going to feel great but at least your loved ones can look after you without worrying about picking up the issue themselves. If viral, the correct steps can be taken to prevent spreading and to treat the infection so you aren’t out of commission for too long. ‹ Is It a Sinus Headache or a Migraine?